Concepts of Arthur was published by Tempus in 2007 under a former nom de plume (288 pp, ISBN 978-0-7524-4461-1). It is a detailed study of the origins of Arthur and the nature and development of the early Arthurian legend, presenting a comprehensive overview of recent scholarship, including the author's own academic research into the sources of the early Arthurian tradition. Update: As of May 2017, Concepts of Arthur has been unavailable in all editions for well over a year and the rights have now reverted to me. As such, I am able to make the original 2007 version of the book available as a free PDF download for those who wish to consult it: please click here to download the PDF. Fundamentally, Concepts of Arthur provides an analysis of the entire non-Galfridian Arthurian legend. Unlike many previous studies of Arthur, it avoids a priori assumptions about the origin and development of the Arthurian legend, preferring to argue from first principles. Most importantly, it considers the 'historical Arthur' as a genuine part of the tradition itself, to be treated alongside – and not artificially separated from – all the rest of the early source material. 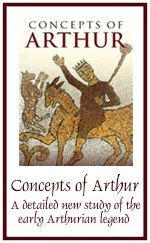 By viewing the 'historical Arthur' in the context of the body of material of which he is a part, significant advances in our understanding of the nature of Arthurian legend are possible – particularly when recent research into the reliability and nature of the supposedly historical references to Arthur is taken into account. As a result of all this, it is argued that Arthur is best understood as an originally folkloric or mythical figure who was historicized in the ninth century. 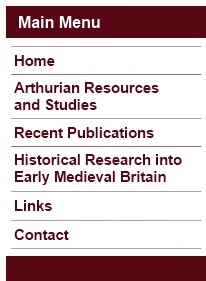 By virtue of adopting this methodology of using all the available non-Galfridian material – including folklore, poems, prose tales, chronicles, histories and saints' lives – Concepts also provides an exhaustive guide to the entire corpus of early Arthurian material and its significance. 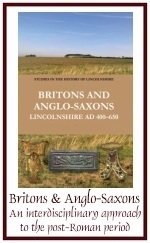 For example, full analyses of Arthur's role as the defender of Britain from all threats and of his intimate connection with the Otherworld form an essential and central part of this study. These are both topics that have been rarely seriously investigated since the widespread assumption of Arthur's historicity became de rigueur in the mid-twentieth century, leading to many of even the best studies devoting all their efforts to those few sources that obviously view Arthur as historical. Similarly it is argued that efforts to understand the origins and implications of the name Arthur have been hampered by this same assumption of historicity – a new approach to these issues is, as a result, offered in chapter five of Concepts. These new insights mean that, finally, some intriguing possibilities can be offered for the ultimate origins of Arthur and the tales told of him. If Arthur was not originally historical, how did the concept of Arthur as a post-Roman war-leader emerge and grow? Who, if anyone, was it ultimately based around, and where might he have operated? Was any original non-historical Arthur simply conceived of as a fictional creature of folklore and popular myth, or have we been too ready to reject any notion of truly mythological genesis for him? If so, can anything sensible be said of this beyond noting its possibility, without veering off into the realms of untrammelled speculation? Such questions can only be approached with caution, but it is argued that the new perspectives on the Arthurian legend pursued in the main body of the study can allow at least some tentative answers and suggestions to be offered. Chapter 3 The Nature of Arthur: ‘A Mighty Defender'? Click the following link for authorial notes and comments on Concepts of Arthur: Author's Notes & Comments. Copyright © 2008, 2017 Caitlin R. Green. All Rights Reserved. To cite articles or pages from this website, use a service such as WebCite or alternatively see one of the following style citation guides. Comments and queries via email to Caitlin R. Green.